Not much has more appeal to a young camper than having the opportunity to use an ax. The lure is irresistible. Yet, ax lore is rarely passed down to our younger generation. The following is a common sense guide which will help a tenderfoot, young or old, learn to safely use an ax for the most basic camp chore – chopping firewood. Keep in mind that “safe” is a relative term. There are risks inherit when an ax is moving, or, even when idle. Our aim here is to manage the risk, not eliminate it. Not teaching children to cope with the risks and dangers of handling edged tools will never prepare them for real-world self-reliance. As I mentioned in our beginner’s guide on knife craft, only you, the parent or guardian, will know when your child is responsible enough to use edged tools. My oldest grandson was seven when I began teaching him how to handle a hatchet. I recommend a general purpose ax for the beginner. The handle length and weight should fit the user. My favorite felling ax is a double bit. This is NOT the ax for a tenderfoot of any age. A poll ax has only one cutting edge and is recommended for first-timers. 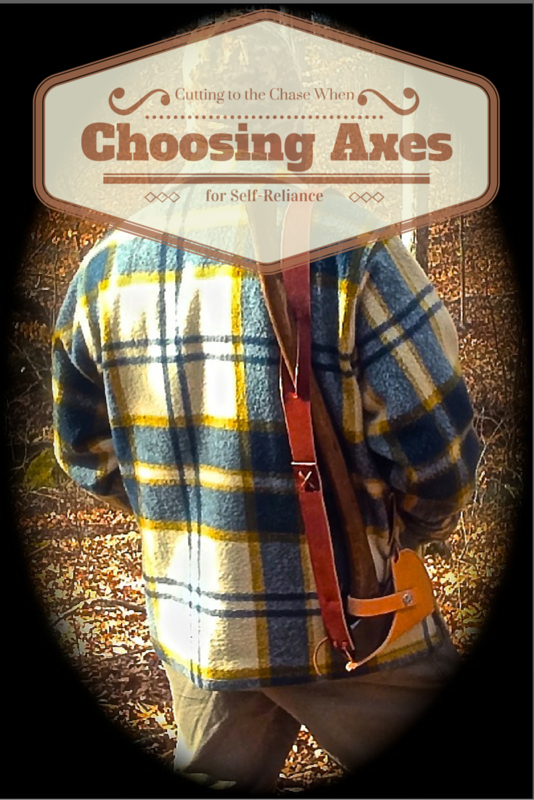 Read our Ax Selection article for more details on choosing your first ax. A woodsman should carry a hatchet, and he should be as critical in selecting it as in buying a gun. Kephart’s advice is sound on carrying a hatchet. And to the tenderfoot, using a short camp hatchet may seem to be the wise choice. However, shorter handled axes are more dangerous to use than longer axes. If I miss my target when swinging my 16 inch hatch, the follow-through, when standing, is likely to strike where I do not wish to strike – my body. A full-size ax, 30 to 36 inches long, would likely strike the ground before reaching a foot or knee. For a young boy or girl, swinging a longer ax which weighs 3 to 4 pounds is ridiculous to even think. In the end, the size of the ax must fit the user. A more suitable choice might be a 3/4 ax, or “Boy’s Ax.” They tend to be armpit to fingertip length with a head weight in the 2 pound range. If camping on foot, this ax trims a few pounds off your pack. Felling trees, splitting firewood, making kindling, and pounding tent stakes can all be done very well with a sharp boy’s ax. There are two basic ways to safely swing an ax: Lateral and vertical chopping. 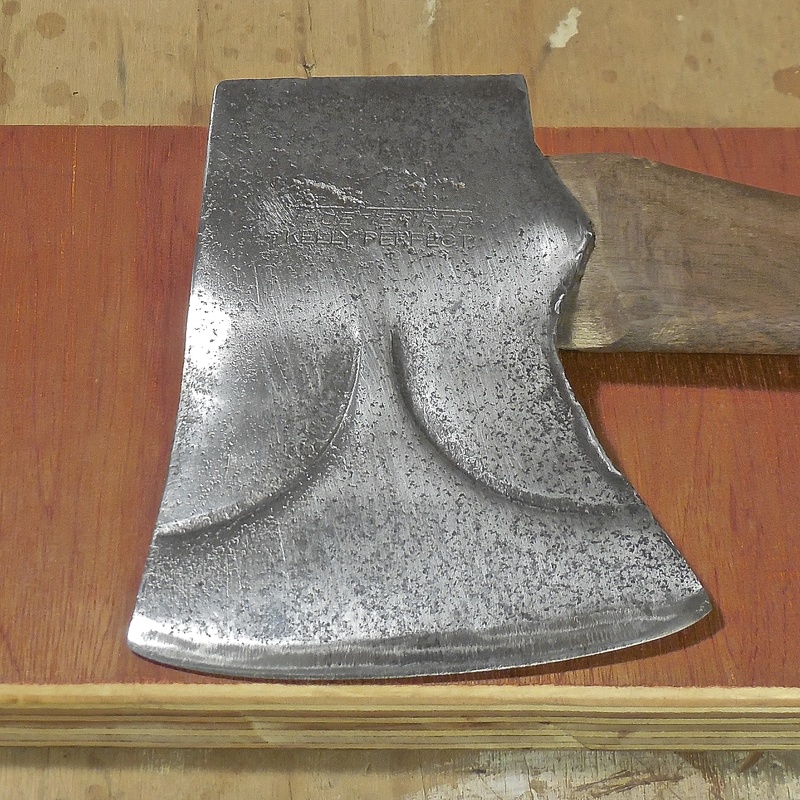 Before you even lay a hand on your ax, be sure no obstructions, people, or pets are in your chopping zone (a circular area two handle lengths around you). Even a small vine or twig can cause your ax to deflect away from your intended target. Lateral swings (diagonal and horizontal) are used mostly to chop down trees. Any stroke outside your frontal zone is considered a lateral swing. What’s your frontal zone? For more in-depth coverage of lateral swings, read our article link here. I DO NOT recommend that a tenderfoot attempt tree felling until he/she becomes proficient with vertical swings while chopping firewood. 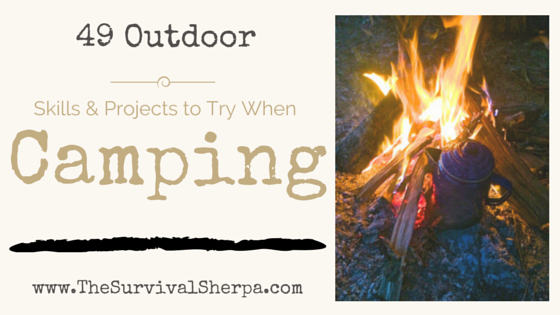 Splitting logs into smaller firewood happens to be the most used vertical swing by the average camper. There are three categories for this powerful stroke. For the tenderfoot, we will only concentrate on #1. The backed-up stroke is the safest of the three for a tenderfoot (or experienced woodsman). Backed-up strokes are performed on piece of robust wood (chopping block or log) wide enough to stop the ax swing momentum. The earth can serve as a back-up but you never want to ground a sharp ax in the dirt. Practice your vertical swing by standing a small log (about 6″ in diameter and 12″ long) on top of a wide chopping block. Position the log near the back of the chopping block, not the center or near edge of the block. 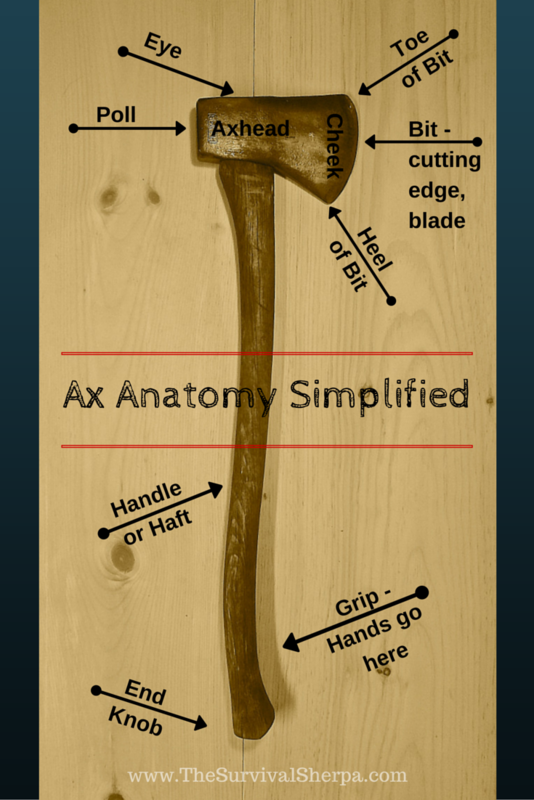 This allows more room for the ax to strike the chopping block as it separates the round log – or misses completely. Note: For younger children using a short ax or hatchet, this exercise should be modified. Here’s how I taught my grandson to chop kindling. Adult supervision required! If you’re grown and strong enough to handle a full or 3/4 ax, stand facing the chopping block. Grip the ax handle with one hand at the base of the handle with the other on top of the bottom hand. Touch the target with the ax in outstretched arms. Raise the ax overhead and strike the top of the log. As you strike the target, bend your knees so that the ax follows through parallel to the ground. 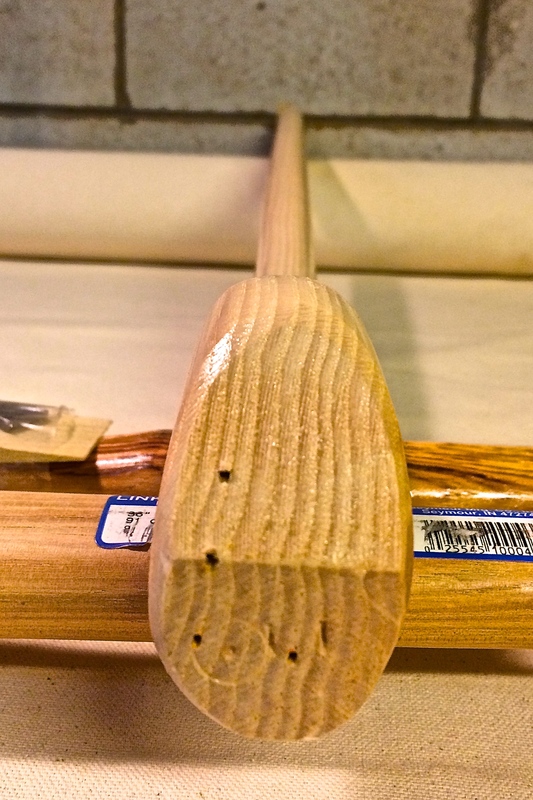 This adds another layer of protection to prevent the ax from striking your body on a miss hit or glancing blow. Focus your eyes on the exact spot your want to strike. Aim small, hit small. On the down stroke, the ax handle should follow an imaginary line drawn with your nose if it were a long sharpie marker… right through the small, focused target. Relaxing your grip on the ax to keep your upper body (arms and shoulders) loose. Your brain will automatically tighten your grip for impact. Let the ax do the work. You can add power to strokes as your accuracy increases. A fun way to practice accuracy is to stand a kitchen match or toothpick vertically in a chopping block. Using a safe stance and full swing, try to split the match/toothpick. You may never strike it but this gives automatic feedback on how close you come to your tiny target. If you actually light a kitchen match on a swing, well, you’re an elite axman! What if there is no “proper” chopping block available at your campsite? Here are two alternative methods I’ve used over the years. This is a Y-branch from a Red Oak I’ve used for years at fixed camp. With a little effort you may happen upon a large Y-shaped branch. Place a round piece in the “Y” on the ground. Straddle the bottom of the Y. Strike the round cradled at the top of the Y. Keep in mind that the Y is not as high off the ground as your previous chopping block. Therefore, bend your knees even more to keep the downward ax swing parallel to the ground. Once a round is split, place the halved log back in the Y with the round side up. It’s much easier to split from the round side than the flat. You may only find a straight log or split wood to use as a back-up. Lay the round to be split perpendicular over the back-up log. Stand with the back-up between your feet and the round. In other words, the round touching the ground should NOT be on the same side of the back-up log as your feet. That setup is inviting injury. To half and quarter smaller logs safely, keep this technique in mind. This works well with smaller axes and camp hatchets. With the ax in your strong hand and the round in the other hand, place the ax bit on the opposite end of the round. Lift the ax and round together and tap them on a chopping block to start the ax bit in the wood. The handle should run parallel down the length of the round now. Now you can lift them both and slam them down on the chopping block. Repeat until the round separates. Always kneel to the ground when using a short ax/hatchet. If the wood doesn’t separate, slam the pieces again so that the ax bit sinks into the chopping block. Now give the wood a sideways twist with your off-hand and it usually separates. To cut smaller stuff (wrist-size and smaller) to firewood length, chop at a 45 degree angle to the grain… on a back-up, of course. The end that separates can go flying so be careful. This forked tree stacked the firewood as it broke. You may not even need to chop long, wrist-size firewood. If you have two trees close together, place the round between them and use leverage to break the round into pieces. Or, just burn them in half over the fire. As I mentioned previously, an ax can cause injury while in use or when idle. Practice the following to decrease the risk to you and others. Keep your ax sheathed when not in use. When in use, sink the single bit into a heavy chopping block instead of laying it on the ground unsheathed. Keep your swing zone clear. Axes are daylight tools. Never chop in dark conditions. Only use a sharp ax. Dull axes will not bite into wood and glance off. Only chop firewood that is backed-up properly. Always check that the axhead is securely fixed to the handle. If it becomes loose, stop chopping. If you become fatigued, stop and rest. An ax is a tool, not a toy! 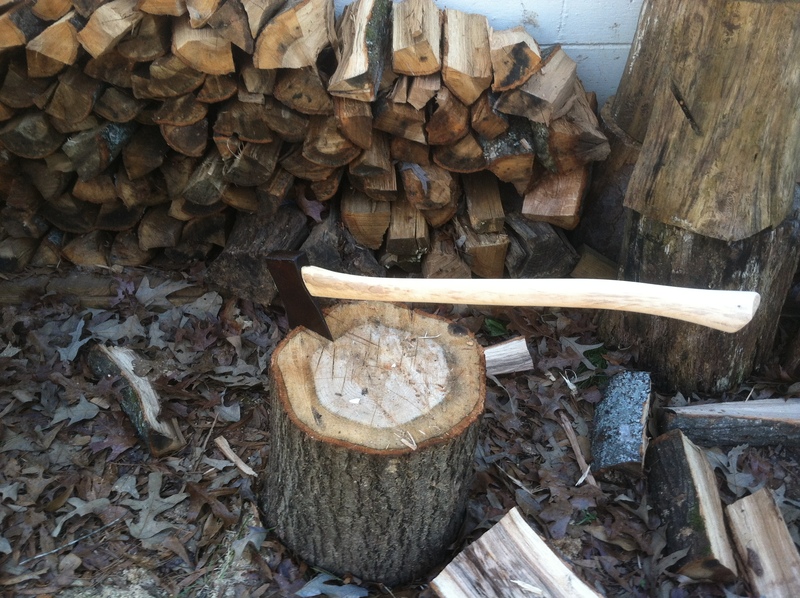 As you become proficient chopping firewood, expand your ax skills. 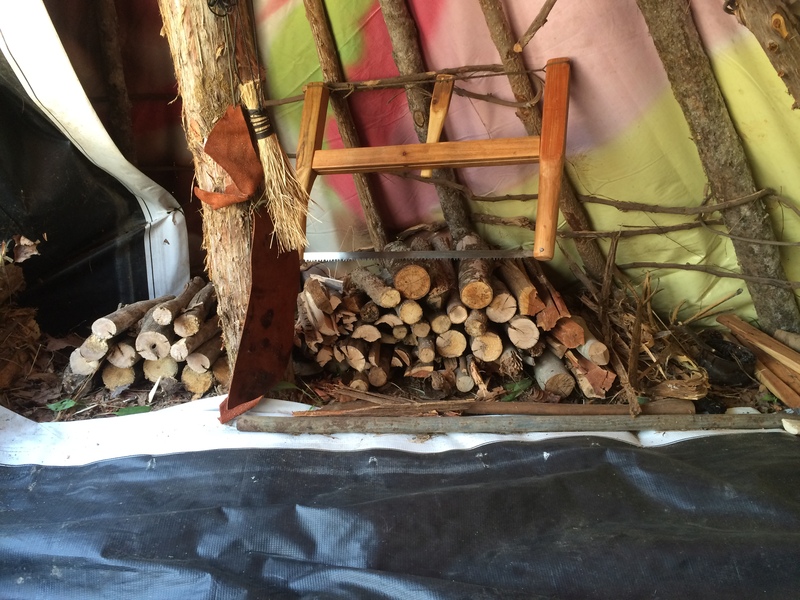 Check out the resources in our Axe Cordwood Challenge Page with links to our ax videos/blogs and other skilled axmen I respect. Planning your spring outdoor adventure? Try these skills and projects, even if it’s in your backyard. In fact, your backyard may be the best place to start your journey to outdoor self-reliance. 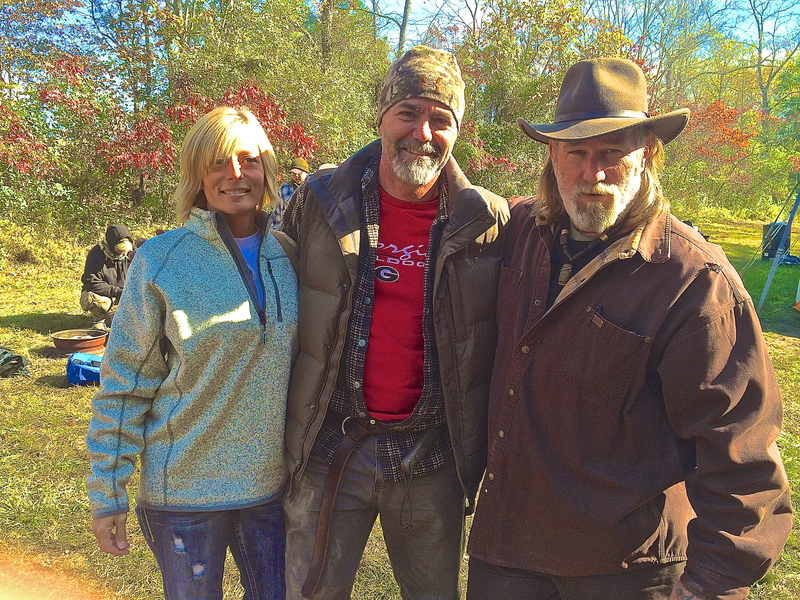 Iris and Dave Canterbury being gracious as usual. Let the fun begin! Get out and stay outdoors. Not many a young boy, in our present chainsaw generation, has ever witnessed his mother fell a tree with her ax. My brain cells blur as to the exact date, kindergarten maybe, but the image of Mama swinging sharp steel rhythmically against that tree is permanently etched in my childhood memory bank. Over 45 years later, my ax addiction continues! How long will chainsaws hum along? Long enough… maybe. Either way, self-reliance requires that one never put all their hopes in one tool. I’m not anti-chainsaw. I love my Stihl… for certain jobs. She allows me to work without much sweat. Ah, but nothing beats a hunk of steel on the end of a stick. When wielded skillfully by fit individuals, it is a thing of beauty and a joy forever! 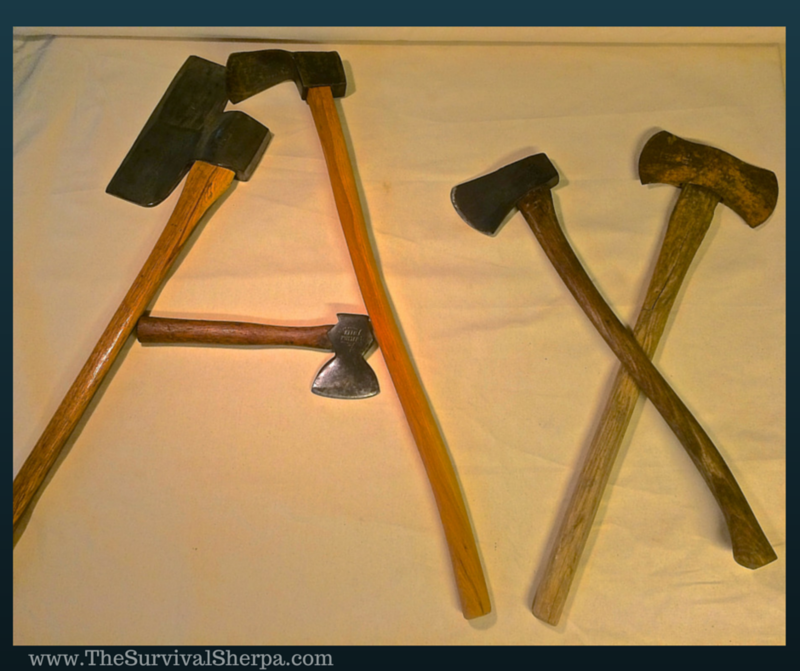 The ax is the oldest, most under-appreciated, yet invaluable tool which serves not only as a wilderness lifeline, but a simple machine that connects your hands to a forgotten craft… Ax-Manship. The ax of our past may be the key to our future. You see, the more complicated a machine (i.e. – a chainsaw) the more likely you’ll need a small engine repair shop in your basement to keep it productive. In the field, at a minimum, you’ll need to carry two types of oil, gasoline, gas can, files, and a bar wrench to harvest wood with this machine. You’ll likely need another machine for conveyance just to reach your woodlots with all the stuff accompanying your chainsaw. A sharp ax (sheathed, of course) can be slung over your shoulder with a sharpening stone in your pocket. That is all. No doubt, a chainsaw can rip through cords of firewood and fell huge timber. But again, the question remains, how long will they hum? If your answer is “forever”, you may view the ax as an archeological artifact with little use for modern man. Even if combustion engines continue to run “forever”, you’ll never regret owning ax-manship skills. 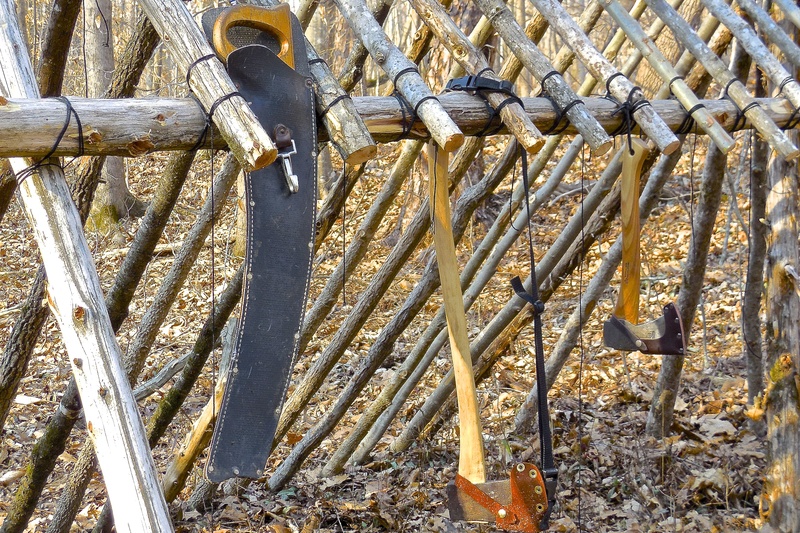 Indigenous peoples, soldiers, farmers, homesteaders, woodsmen, frontiersmen, and craftsmen of old knew the value of this tool and how to use it. 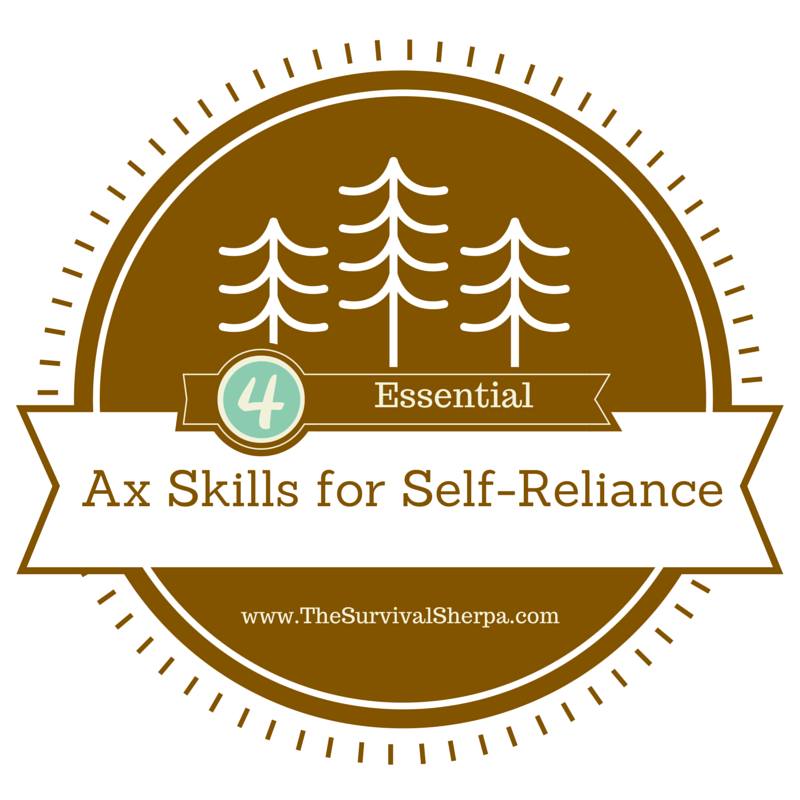 Every self-reliant man should learn these 4 basic ax skills… safely, without shortening your toes. Warning: Axes are daylight tools. Safe and efficient ax skills only come from using your ax(es) properly. Like other tools, choose the right one for the job. Felling and bucking wood is not the only job axes do well. Job specific axes include: hewing, ship building, butchering, carpentry, fire fighting, wood carving, and many more. Without experience felling trees, you should never lay an ax to a trunk you can’t reach around with one arm. 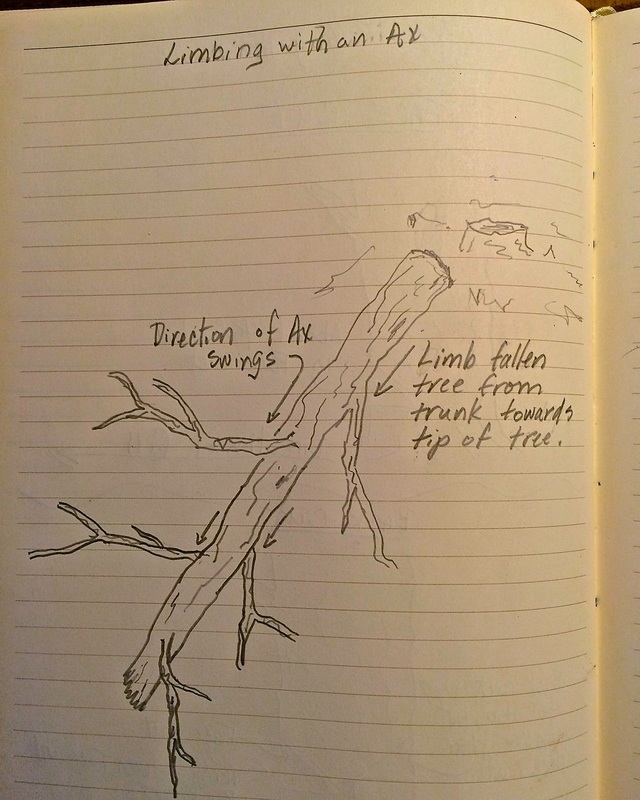 Practice accuracy and technique on smaller trees. Determine the lean of the tree to be felled by viewing it from a distance two directions: front and 90º to the side. Hold/hang the end of your ax handle between your thumb and forefingers and use it as a plumb line to sight the tree’s lean. This will help you determine the lay or path the tree will fall. 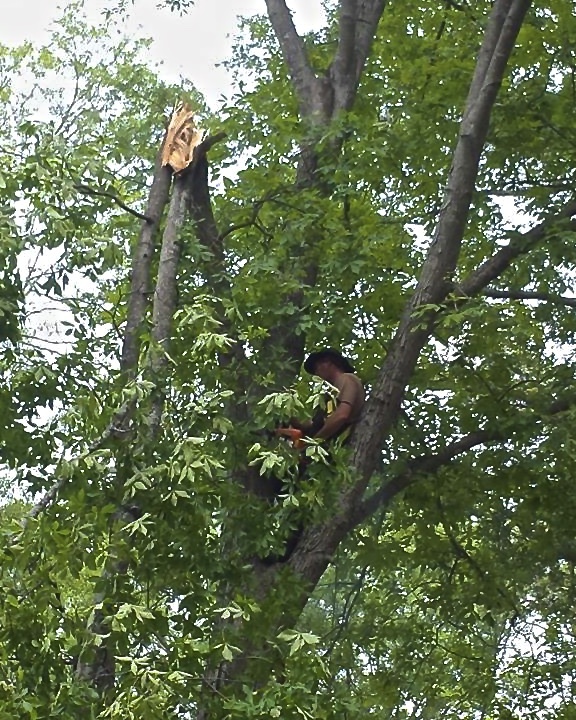 With proper tools (wedges, jacks, ropes), a skilled axman can make most any tree fall in his/her desired direction. However, it’s much easier to fell a tree towards its natural lean if that path is clear of other obstacles. Visually check the tree for any widow makers (dead limbs) that might dislodge and crash onto your body. Dead standing trees are excellent for firewood but also pose a higher risk of dropping limbs when being hacked on. Even small twigs falling can damage your eye the moment you look up to check. Eye protection is advisable. Clear your swing radius of all debris that might snag your ax mid swing. Miss hits and glances mean potential injury. Watch the wind. Predominant wind direction and gusts can be your friend or foe when felling trees. Have multiple escape routes. Things can go very wrong if a tree kicks back or gets snagged in an adjacent tree on its decent. Take time to plan and clear paths. Be ready to drop everything and retreat if need be. Position your body so that your feet are behind the chopping strokes and to the outside of your feet. Chopping stokes should be outside the “train tracks” (two parallel lines running to the outer edges of your boots) with your feet inside the tracks on flat ground where possible. Aim to make a 45º face cut near the base of the tree. This notch should go about halfway through the tree and be perpendicular with the imaginary line of fall. Make progressive cuts in a pattern to remove wood chips. Accuracy is more important here than strength and power. Never swing in an upward manner to remove wood chips in the notch. Upward ax swings are likely glance and end in your face. Continue making 45 degree cuts from top to bottom of the face cut. Decreasing your swing angle slightly to about 10º will help remove chips… just never swing upward! Also, keep the ax handle as horizontal as possible while swinging. Do this by flexing your knees and waist with the ax head at 45º. 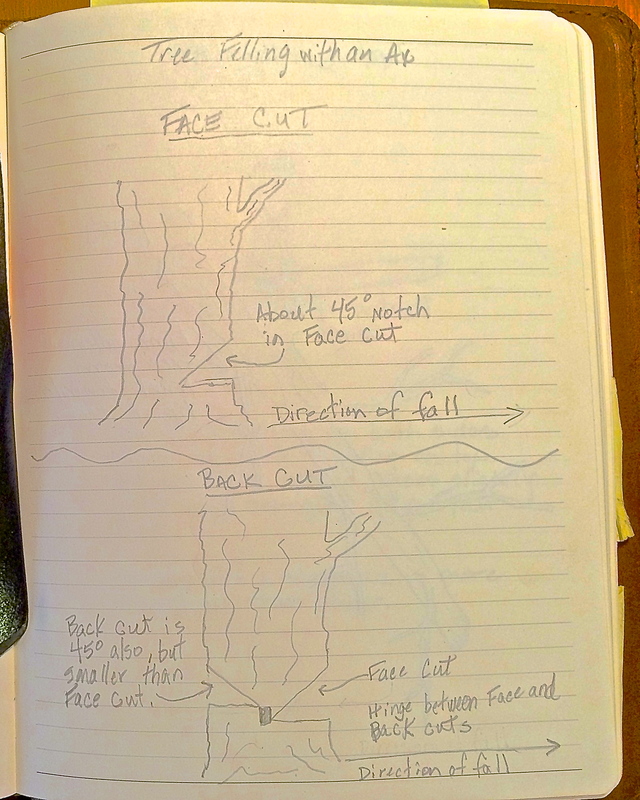 Now you have a 45 degree face cut with an even shelf about halfway through the tree. Time for the next notch. The back cut is a smaller version of the face cut. Again, this cut needs to be a 45º notch with its shelf an inch or two higher than the face cut shelf. This hight difference creates a “hinge” between the two notches. The hinge serves as a safety device to prevent kickback when the tree begins to fall. Even with smaller diameter trees, the weight of the tree falling causes the base of the tree to push backwards. It’s physics. You may find it helpful to score the area of the back cut with your ax to give you an accurate target. Use the same cutting strokes as you did with the front cut. As you close in on the front cut from the rear, pay attention to the trees movement. Once it starts to lean, you may get one more swing in. After that, it’s time to get out of the way and let gravity take over. Do not stand directly behind the falling tree. Move to a safe distance to either side… and get ready to drop your ax and run if need be. Swing in a direction from the base (trunk) to the top of the downed tree. This removes the limb even at the trunk leaving little to no snags. Start by removing limbs from the topside of the downed tree to prevent them from interfering while limbing side branches. Remember to keep your feet inside the “railroad tracks” and the limb outside the tracks on all horizontal swings. Once severed, remove to keep your work area clear for side limbing. Keep the tree trunk between you and the limb you are removing when at all possible. Keep your body slightly forward of the target limb as you swing. Once your tree is down and limbed, you need to move it to camp or your woodshed. If the chainsaws are no longer humming, vehicles probably aren’t either. Or, you may be too deep in the backwoods to be reached with a truck or tractor. Buck it! Bucking is the process of chopping logs into manageable lengths for conveyance. If you know the length of your ax, use it as a measuring tool to lay out the log sections to be bucked. Scotch the log with wooden wedges or smaller branches on both sides of the log to be bucked. Stand on top of the log with feet straddling your cut mark. (This is an advanced technique. Bucking with feet on the ground in the video below should be practiced before standing on a log for bucking) Spread feet about shoulder’s width apart with knees and hips slightly flexed. This stance is adjusted up or down depending on the length of your ax. 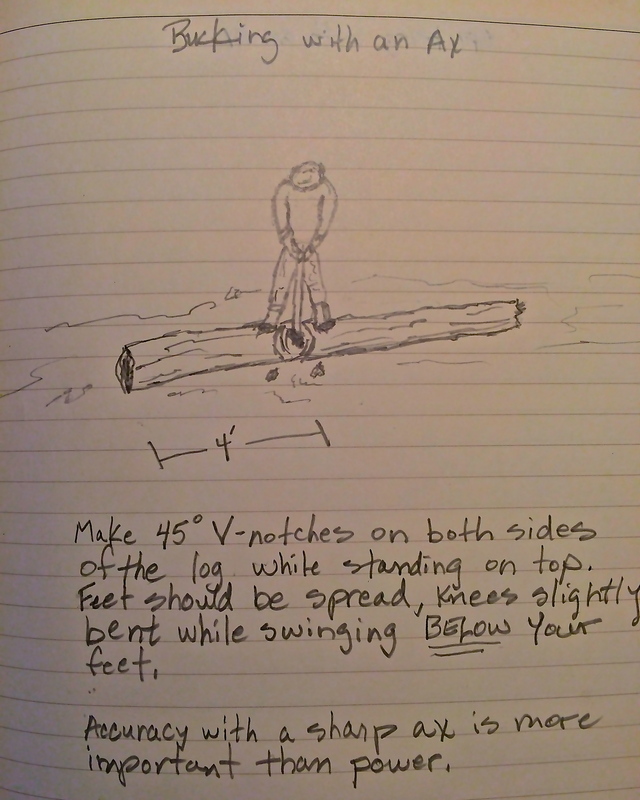 Maintaining your balance, swing accurately and begin making “V” notches from the center of your mark to a width equal to the diameter of the log. For instance, a log 10 inches in diameter will have a V notch about 10 inches wide. Once you’ve notched one side of the log, turn and repeat the notching on the log’s opposite side. 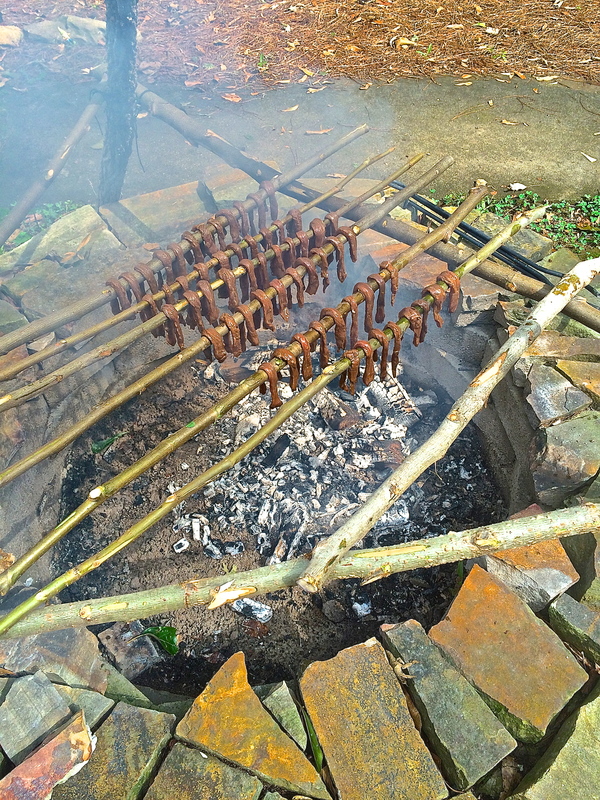 The two V notches will meet in the middle of the log and break apart. Splitting both short and long bucked logs will be covered more thoroughly in our next post in this series. But for now, here is a video that will give you a few tips on how to safely split firewood at camp.